The other evening I had the pleasure of visiting Old Trafford soccer stadium. It's the home of Manchester United, arguably the most successful soccer team in living memory. The other evening I had the pleasure of visiting Old Trafford soccer stadium. It's the home of Manchester United, arguably the most successful soccer team in living memory. Consistently at the top or near the top of the British Premier League and European Champions League in the late 20th and early 21st centuries, the 'Red Devils' have enjoyed a glittering period of success since 1990, four years after Sir Alex Ferguson became the team manager. Today, it is thought to be one of the richest in the world and commands the highest revenues. It's team stars are feted, regularly appear in the press and are paid millions each year to entertain their fans. The stadium holds more than 75,000 people and is the largest of its kind in the UK by some distance. 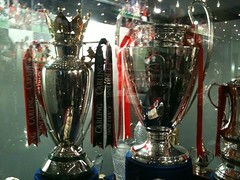 As an armchair soccer fan it was wonderful to see the trophy cabinets, reflecting a history that goes back to 1878. Seeing the great names from the past celebrated on the walls and in the museum cabinets evokes a sense of pride. But it was the passion of our guide that struck a chord. He has been a fan for 52 years and works as a museum and ground guide. As we sat for a few moments in the best seats on a cold and damp night, you could almost see the ghosts of past sporting heroes. As he reeled off the names, talked about the club's highs and briefly described some of the club's stellar moments I saw a twinkle in his eyes and a swelling of the chest in pride of something that brings joy to thousands of people every week. Of course it hasn't always been that way. In 1958, the team lost eight players and several staff members in the Munich Air Disaster. It sent a shock wave through the nation and, at one time, it was thought the club would fold. 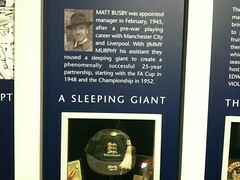 Under the leadership of Sir Matt Busby, Man U was rebuilt, bringing forward some of the most famous names in the club's history, including George Best, one of an elite few regarded as the greatest players of all time. What does any of this have to do with enterprise applications? The links may be tenuous to some but they are there. When a great soccer team has great leadership then it almost doesn't matter what the composition of the team looks like, the odds of them winning are always greater than if the manager is not so strong. Great leaders know how to coax and cajole, reward and discipline in a way that always has the interests of the team as his foremost objective. That and winning. Winners attract winners and it is no surprise that the best of the best want to be in the company of other great stars. When I look at the Oracle Aces or the SAP Mentors I get that same feeling of passion as our tour guide displayed. They'll go the extra mile without thinking twice. They know the 'team' limitations but they're not allowed to get in the way of moving things forward. When a team does well it is rewarded by a loyal following. Think about the number of life long fans, the premium value that seats command, the add-on merchandise market and other income sources. Now think about long term customers like Nestle or Siemens for SAP or, for that matter, SAP for Oracle DB. There is however one crucial difference. Each year, all soccer clubs depend on subscription renewal as base line income. For the top clubs like Man U, it's not enough the team does well. It has to shine, delivering extraordinary value each and every match. The days they lose there is a post mortem, sometimes accompanied by a roasting by commenters. If there is a run of poor form the top head rolls. There is no sense of entitlement but a constant striving to do more, do better. There is a sense of 'ownership' among fans who think nothing of 'offering' management the benefit of their field side wisdom. Fans can be powerful voices of dissent which they'll voice with the same vigor as their roars of support. They can do so because they always have the option of voting with their wallets. Compare that with the way the user groups have, until recently, been captive to the vendors or the way the perpetual license and maintenance tax has gone unchallenged. Regular readers will know that's changing as SaaS becomes more popular. As I was in Manchester as a guest of SAP's UK and Ireland User Group, the visit to the ground was a perfect foil for comparing soccer and enterprise apps. This group has become independent of SAP to the point where it charges for it to have a booth at the conference expo. It's voice is being heard as issues of importance become increasingly pressing. To its credit, SAP is learning how to respond appropriately. There is a ways to go. Oracle's User Groups on the other hand have long held positions of independence. It is that independence that helps foster some sense of partnership, even if it comes at a premium price. Right now SAP is going through a tough period with many almost writing it off. Some of the more lurid headlines would see the company acquired or thrown into the dustbin of IT history. But like great clubs, SAP has a tradition that is not easy to shrug off. Is that where the similarities end? Time will tell. But if you're an avid sports fan then maybe this will resonate.